The Powerware 5110 uninterruptible power system (UPS) was designed to provide the best UPS power protection against the threats that lurk in public utilities. This line-interactive UPS system delivers the ultimate in power quality, constantly safeguarding your equipment from power outages, surges, sags, brownouts, and over-voltage conditions while also providing varying degrees of power management for additional threats. 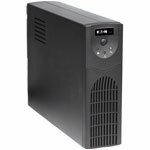 If utility power is interrupted, even briefly, the Powerware 5110 transfers to UPS battery power.